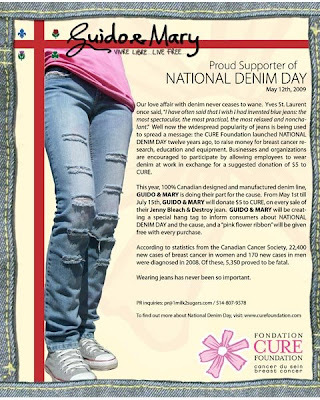 The CURE Foundation launched NATIONAL DENIM DAY twelve years ago, to raise money for breast cancer research, education and equipment. Businesses and organizations are encouraged to participate by allowing employees to wear denim at work in exchange for a suggested donation of $5 to CURE. From May 1st till July 15th, GUIDO & MARY will donate $5 to CURE, on every sale of their Jenny Bleach & Destroy jean. This particular jean will be available at retailers such as Bleu Marine, Mimi and Coco and Mousseline. Go shop for a good cause! Thank you for posting "National Denim Day' my Mother just completed her treatments in January so this is very important to me! p.s I gave you a shout at Blog Catalog with my email!